Love adventure and role-playing games?Thenthis game is for you! You have to survive in a world aftertheapocalypse. Planet is inhabited by mystical creatures -pixelmonspocket - and horrible zombie - killer! Find and catch asmuch aspossible pixelmons to become their friends. The gamefeatures morethan 50 different types of pikselmon , which aredivided into types(water, fire, air). Can you catch them all? Explore the abandoned mines in order to find moreloot,and you can become a master of crafting! Arrange a battle with your friends in battlearenaonline multiplayer! Find out whose pixelmon stronger! This game is suitable for all teenager boys andgirlswho love to craft and who have developed imagination andcreativity! Play creative mode where your resources are limited,and buildbeautiful buildings and castles, and become a truemastercraft! The game has a system of raising the level ofyourhandheld friends - pixelmon ' s ! Fight, win and your friendwillevolve and become more powerful! Faster download and play in the best simulator crafting,buildingand survival in 2016 for free! You want to go in an interesting adventureinthe world after the apocalypse , in which they live zombiesandpixelmons? You like craft , loot , explore abandoned minesandsearch for food in order to survive ? Then this newsurvivalsimulator based on the famous game about survival and craft, withthe mod pixelmon multicraft .Explore the land, populated pocket creatures , fight withotherpixelmon on the battle arena , increase the level of yourcreaturesand they evolve evolution ! Build a home for your friendsand livethere with your friends pixelmons pocket . And also playwith yourfriends in fact online in multiplayer mode !This game is perfect for anyone who loves craft and wants tobecomea mastercraft , for teen boys and girls . The game addsnewgraphical textures and fashion , as well as the opportunity toplayin the third person !Features :- Crafting- Building- Creatures- Multiplayer- Open World- the change of night and day- Battle arena pixelmon- pixel ball- survive- cars- gunsRather, download and play with your friends for free inthesimulator catcher pixelmon. 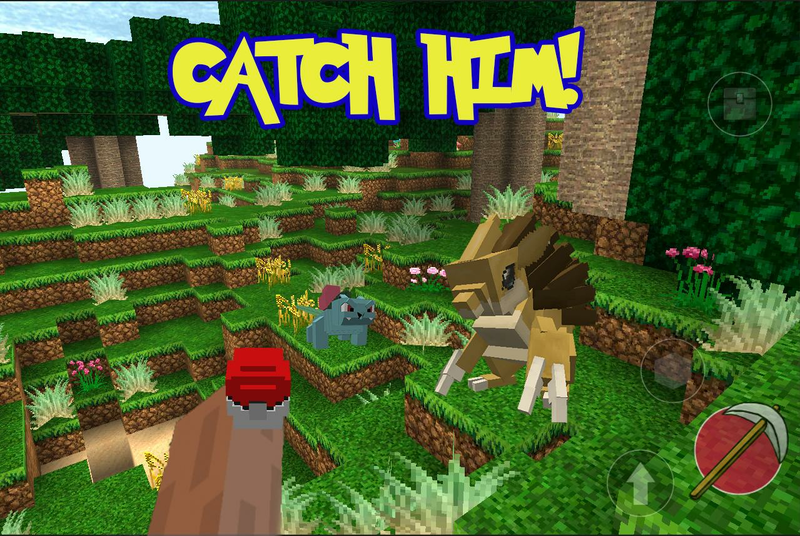 Are you looking for adventure and wanttoimmerse yourself in a world populated by mysterious creatures-pixelmon ' s ? Then this new survival simulator with elementsofcrafting game 2016 - Craft Go : mine pixel mod - just for you!Thisgame is for all those who love crafting lovecraft.To survive in an open sandbox world after the apocalypse, locateandcatch rare pockemon , make friends with them, build a pokehouse ,multicraft kraft carrying weapons, clothing , loot , car ,minebuild.Fight with your pocket monster with zombie - killers, whoalsoinhabit this world! Swing level and train your pixelmon andthen itevolves into a more powerful monster ! You can fight withyourfriends in multiplayer mode online! Compete in a specialbattlearena and find out what pikselmon stronger !You have to rebuild this world for themselves ? Be creative andyouwill become the best in this game to their friends in multplayer!Become a mastercraft . You will be surprised pumpingsystem:pixelmon can evolution . You can also play on the faces ofthird .this game is suitable to all teen boys and girls whoarecreativecatch as much as possible pixelmon, survive and fight withthemagainst monsters in this world !features :- open world planet ( sandbox )- crafting- survivng- zombie- pixelmon- the change of night and day- multiplayer- story mod- skin- poke ball- building- diamonds- battle arena pixelmon's- creatures- sandbox- new texturesFaster download and play with your freinds in the best gameofthe year - MCPE pocket edition Go craft pixelmon mod online ! You love adventure? Do you want to explorethiswonderful world after the apocalypse (fallout) , zombie killerwhoinhabited and pocket creatures - Pixelmons? Then this game isforsure, for all teen boys and girls ! Survive on this planet (sandbox) , find out all its secrets, study abandoned mines, Craftitems:weapons, clothes, blocks, cubes - collect loot in the cavesand lookfor treasures! Catch pixelmon in his pocket , fight withthem, trainthem. You will be surprised pumping system pixelmons :they canevolve evolution ! The game has improved crafting system: craftinghasbecome easier and easier! Added a lot of items to craft, such asashovel , pick , axe , bench. Fight with other pixelmon to the battle arenawithfriends in online multiplayer : Learn more than one pocket. This game will suit anyone who likes Kraft. Show abitof fantasy and imagination and become a true mastercraft ! Alsoyoucan play in a special mode where you have limited resources andcanbuild anything you want . Or go through the story mode . Also,thegame has added the ability to play in the third person, as wellasnew skins texture and achieving a high resolution !features :- Crafting- Open world- The change of night and day- Multiplayer- Mod- Creatures- Skin- Pocke ball- Building- Guns- Cars- Battle arena pixelmon's- Zombie- Pixelmon- survivingRather, download and play with your friends for free inthesimulator catcher pixelmon GO pixel - mod skin craft pocket !. Immerse yourself in the world aftertheapocalypse, which is inhabited pixelmons mystical creaturesandterrible zombie - killer! You have to survive in this world,buildhimself a shelter and to craft items (weapons, axes, swords,loot),catch and find pixelmon ' s , so you can protect yourselffromattacks by monsters! This game is suitable for all teen boysandgirls who love to craft and want to become a master ofcraft. Creative imagination and creativity to builtbeautifulbuildings and explore this world, full of riddles andabandoned oldmines, where you can find diamonds and lost treasure(loot)! Youwill need helpers to do this - so gather a collection ofpocketPoke pixelmon ! You can also raise the level of yourPocketfriends, so that they become stronger and evolve to fight onthebattle arena with your friends in online multiplayer! Complete story mode to find out how this world wasasandbox! Or a creative mode where your resources cubes will notbelimited, and you can build anything you want! application Features MCPE mine pixelmon : craft GO- surviving- Open the world after the apocalypse (sandbox)- the change of night and day- zombies- pikselmony- kraft- Crafting system- Different game modes- A lot of loot, mines, diamonds- New skins, textures and fashionFaster download and play in survival simulator Explore modcraftpixel cube online multiplayer and fight in the arena forfree! Love adventure and role-playing games?Thenthis game is for you! You have to survive in a world aftertheapocalypse. Planet is inhabited by mystical creatures -pixelmonspocket - and horrible zombie - killer! Find and catch asmuch aspossible pixelmons to become their friends. The gamefeatures morethan 50 different types of pikselmon , which aredivided into types(water, fire, air). Can you catch them all? The game features an interesting crafting system.Youcan imagine to craft weapons, armor and pixel blocks cube fortheconstruction of their shelter Explore the abandoned mines in order to find moreloot,and you can become a master of crafting! Arrange a battle with your friends in battlearenaonline multiplayer! Find out whose pixelmon stronger! This game is suitable for all teenager boys andgirlswho love to craft and who have developed imagination andcreativity! Play creative mode where your resources are limited,and buildbeautiful buildings and castles, and become a truemastercraft! The game has a system of raising the level ofyourhandheld friends - pixelmon ' s ! Fight, win and your friendwillevolve and become more powerful!Features Multicraft Go pikselmon kraft :- An open world (sandbox)- the change of night and day- Poke Ball- Pocket pikelmon- building- Crafting system- evolutionFaster download and play in the best simulator crafting,buildingand survival in 2016 for free! welcome to the new mod - pocket craft:multicraft GO , In it you have to survive in the world aftertheapocalypse . 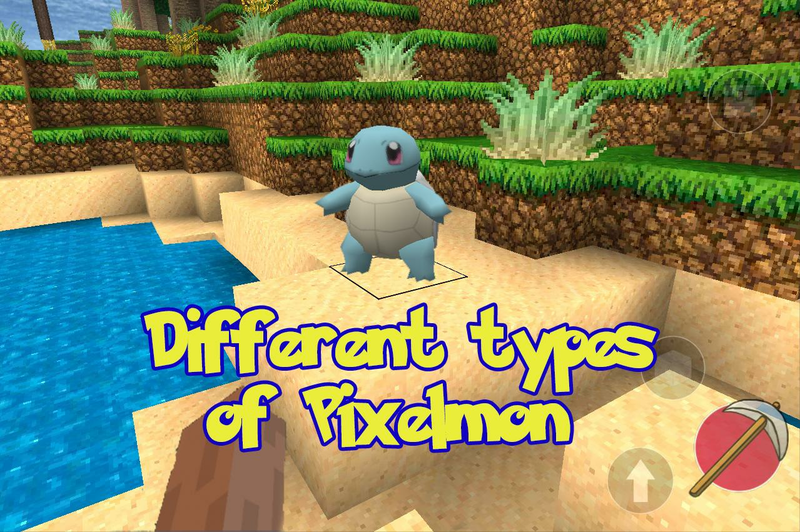 This world is inhabited by different speciesofcreatures , for example : zombies , pixelmons , beasts .You can catch pixelmon only with pixel phone ! Find him , andlookat the world pixelon! 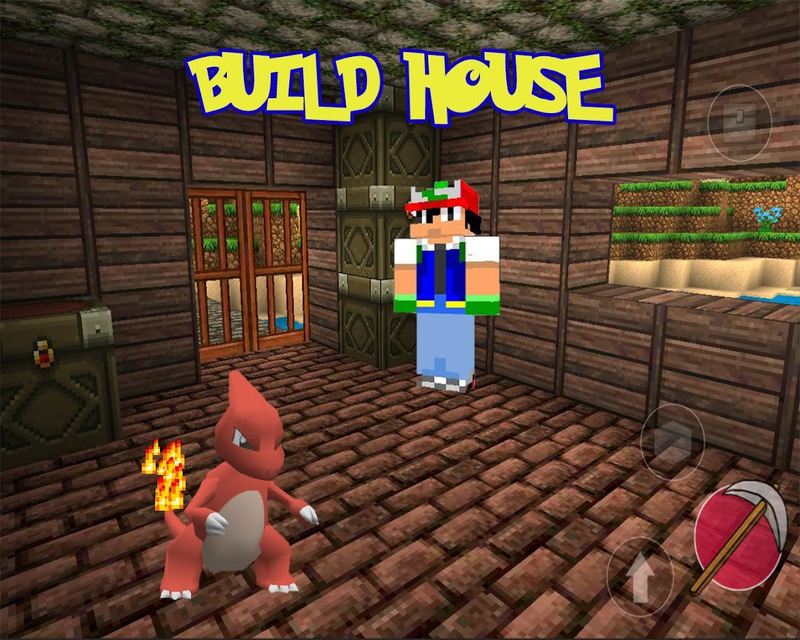 Pixelmon help you for build poke-house,craft items . In the game there are more than 100 different kindofpixel animals. You can Build your pok home and live therewithpixel friend ! Play with your friends in multiplayer !Increasepixelmon's level ( evolution ) and become the coolest ! Youmaybecome a craftmaster !Features :- open world ( sandbox )- day and night cycle- Crafting system- evolve- battle arena- capture pixelmon- kraftStart playing the multicraft GO and become the very firstownerof all creatures right now Absolut free! this is a new game in 2016 , where you havetosurvive in the open world .You will help to survive mystical creatures - pixelmon .Thesepocket creatures to help you to fight with the enemy ! tofindthem, you need a phone and poke ballFind stores , create weapons , and help your pixelmon turninstronger ( evolution )Compete with your friends online in multiplayer and check whichofyou is better! Become a master catcher Pixelmon :)Features :- building pok home- sand box (open 3D world)- Pok crafting system- kraft- evolve system of pixelmons- enemy ( pokezombie )- multiplayer- day and night cycle- Skins, texture pack- Weapons ( pocket ball )Download Multicraft : pixel GO craft and become 1st ofbestplayers absolutely for free online , without advertising ! I greet you in my game - pixelmon world:pocket craft GO . In it you have to survive in a world withyouranimasl - pixelmon's . Build Pocke home, collectlegendarypixelmons be a craftmaster ! Fighting with other playerson buttlearena and find out whose pixmon cooler online onmultiplayer!The game has system of craft , new textures , skins . You canlootmany weapons , for example : gun , pocke ball , car , andeachother . You need increese level of your pixelmon ( evolve ) .Besmart and best of this world with your new friends ! 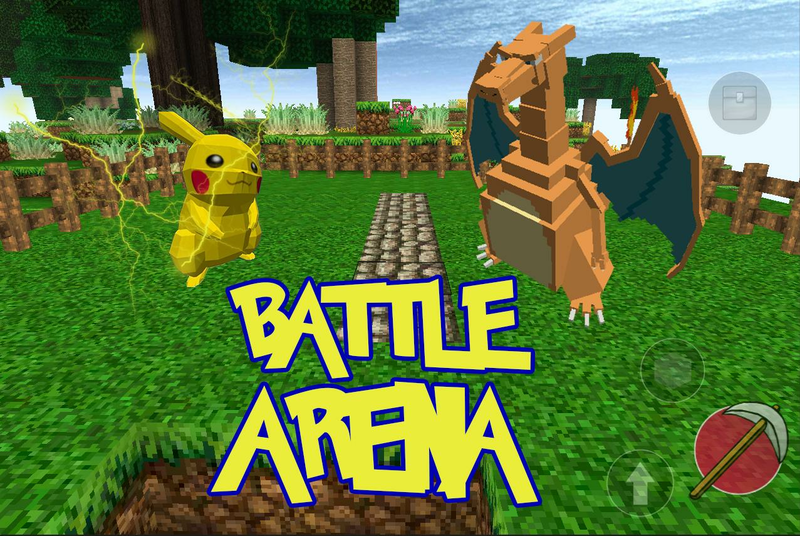 also thegamehas a third person view !Features :- pixel 3D world ( sandbox )- Crafting- Building- Multiplayer- Day & Night cycle- Battle arena- zombie- cars- guns- Pocke balls- Pixelmon- MCPE modRather, download the game and defeat the enemy withpixelmon'sabsolutely free ! Welcome to the game - pixelmon mineexplorationGO. In this game you have to survive in a world aftertheapocalypse, which is besieged by numerous zombies andmysticalcreatures. They are called pixelmons. Find poke ball andtamethemselves cherished pixelmon. After that, you can exploretheworld of handheld craft participating in the Battle Arena(pokestop), creating a variety of things that will help increasethestrength of pixelmon, thanks to the latest and interestingcraftingsystem. Also you will be able to build your house, whereyou willspend the night, because the night in the woods scary anddangerouswalk Pixelmon's, newcomers cope with them will bedifficult. But donot worry, collecting the right amount ofexperience you can alwaysevolve their pixelmon's! To becomestronger and defeat all thedangerous creatures and becomecraftmaster!Features:- the change of night and day- Battle Arena- Improved Crafting System- open 3D cube world- system of evolution- Equipment, weapoons- Zombie- catching pixelmons- Multiplayer- texture pack and skinsBegin to explore the world of multicraft pocket GO withyourfriends online absolutely free! Ingresa a nuestro sitio móvil de CPokémon e infórmate rápidamentede todas las novedades del mundo Pokémon gracias a nuestro WebLauncher.En nuestra web móvil podrás disfrutar de los mismoscontenidos que la web normal.- Noticias- Trucos & Claves-Información de los últimos juegos Pokémon Rubí Omega & ZafiroAlfa, Pokémon XY, etc.- Guías completas para pasarte losjuegosAdemás podrás ingresar a nuestra comunidad de Foros ycompartir opiniones con otros fanáticos de Pokémon.¡Losesperamos!Login to our mobile site CPokémon and learn quickly allthe new Pokémon world thanks to our Web Launcher.On our mobile siteyou can enjoy the same content as the normal web.- News- Tips &Keys- Information from the previous games Pokémon Ruby &Sapphire Omega Alpha, Pokémon XY, etc.- Complete Guide to bustinggamesYou can also join our community forum and share opinions withother Pokémon fans.See you there! free game for girls ! Feel yourself like aprincess ! Try this sweety game for girls-teenagers. Play increative mode with unlimited resources or mine minerals deep in thecube world for girls. Cuddle and play with kittens and puppies !Build your dream home with cube blocks. Build a whole city withSPA, Nail Salon, Pet store and Studio Makeover! No dolls for littlegirls! Only cute animals around you! Cute pocket game for cutegirls! Also build zoo and pet store.in the game you will be able totrain animals of different teams! It is also possible to become avet to help little animals. Be creative and craft your own kitchenwhere you can cook! For this you will help cubic blocks! Master anew world, go to high school and become the most beautiful Queen!If you love crafting and animals, then this game is for youabsolutely free! Pink the world of cute animals is waiting for you!features:- Day & Night cycle- Cute animals- High school mode, Princess mode and The vet mode- Multiplayer ( kitchen wars )- A lot of pink skins and texture pack- System of craft- Secret animals ( pixelmon )- Exploration life of little princess- Open 3D cube world ( sandbox )If you love mine & craft , download Princess craft : kittygirl and be wondeful and creative !